Executive Summary - A prepaid card that has reasonably low fees. It also has a bill pay system which will appeal to some people who want to use their card to pay their monthly bills. It does however face some stiff competition from prepaid cards from American Express and Western Union from a fee perspective. Summary - The AccountNowÂ® Prepaid MasterCardÂ® Card is one of the best prepaid credit card both in terms of cost and fees. It has lower fees and application costs than most prepaid credit cards. It has different cards that is designed for both regular and light users. FDIC Insured Deposit - Like all prepaid cards, you will have to deposit money to use them (like a bank debit card). Potential customers will be happy to know that their deposit is FDIC insured (like all banks) for your deposits. Low Cost and Fees - When you are applying for a prepaid card, the first thing you really have to watch out for are the fees. The good news is that the fees for AccountNow are ralatively low. But depending on whether you get the classic or gold version, the fees could vary. So let's examine this issue more closely. Fees For Account Now Classic - The Classic Version has free direct deposit, cash deposits, check writing and cash withdrawals at grocery or retail stores. There is a $1 charge for each purchase and a $4.95 initial fee. There is no monthly fee as well. Fees For Account Now Gold - The Gold version has free direct deposit, cash deposits, check writing, purchase transactions, cash withdrawals (for retail stores and groceries) and no initial fees. There is no monthly fee if you load $2,500 each month into your card. Otherwise, there is a $9.95 charge. Pay Anyone BillPay - The Account Now Prepaid MasterCard has a BillPay service which allows cardholders to automatically pay monthly bills. You can also pay online and monitor your account online via their BillPay website. The first 7 payments in the month are free. So Is the Account Now Worth Getting? - If you are looking to get a prepaid card that is not issued by a mainstream bank, chances are that you have bad credit or have problems with the chexsystem. The key to choosing the right prepaid card is the fees (because they can add up to quite a bit of change every month). The AccountNowÂ® Prepaid MasterCardÂ® Card has lower cost and fees than most other prepaid credit cards. The AccountNow Pay Anyone Bill Pay service is a good online tool to help you pay your bills. (check out their website for a video demonstration). But having said all that, there are a couple of other cards that have lower fees than this card. 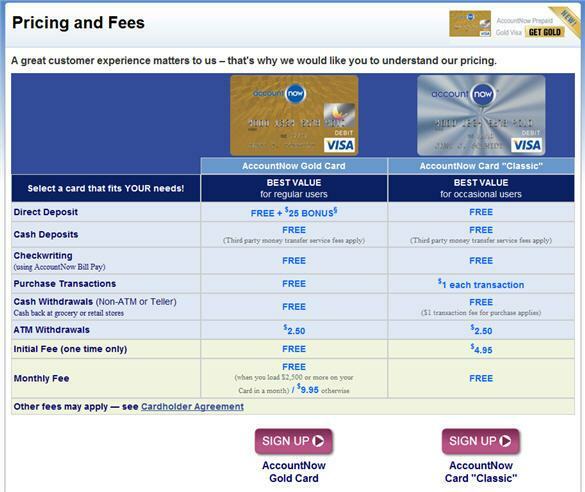 For example, American Express has a prepaid card (that requires no credit checks) that literally has no fees (no transaction fees, annual fees, monthly fees or processing fees).Furthermore, if you use their card "responsibly", you might even get an American Express charge card offer within six months of using their card. The Western Union Money Card is another card that has almost no fees. I suppose one of the reasons they can afford not to charge too many fees is because they have a huge money transfer business and the prepaid card is just part of their business and not the whole business. Irregardless, you should check out these two cards as well to do some comparison and see if it is a better fit for you. Western Union MoneyWise Prepaid Mastercard - Best Known Name, But Is It The Best?